If you have been following my blog, you know that in June I traveled to Italy, and while there, I photographed my way from Venice to Rome with stops in Cortona, Siena, Florence, Pompeii, Positano, Capri, and Ravello. I recently completed reviewing my images and selected almost 300 for a recent slideshow presentation. I uploaded those same images to my Website today, and they are organized as they were in the presentation, that is, by location and in the order that they were photographed. If you have seen some of my previous blog articles about the trip through Italy and enjoyed seeing the images included in those articles, I encourage you to visit my website and see the slideshow presentation. To do that go to: http://stabone.com/p275192001 and when there, click on “Slideshow” in the upper right corner of the web page. This article concludes my articles and images from Italy (until the next trip). It was a fantastic visit to a country that is a photographer’s dream. There was an beautiful image to be made just about everywhere, everyday. My upcoming photography plans include photographing hundreds of acres of fall blooming sunflowers west of Baltimore, waterfalls in Ricketts Glenn in Pennsylvania among fall colors, sunrise and sunsets in the Shenandoah Mountains, and Chincoteague National Wildlife Refuge. 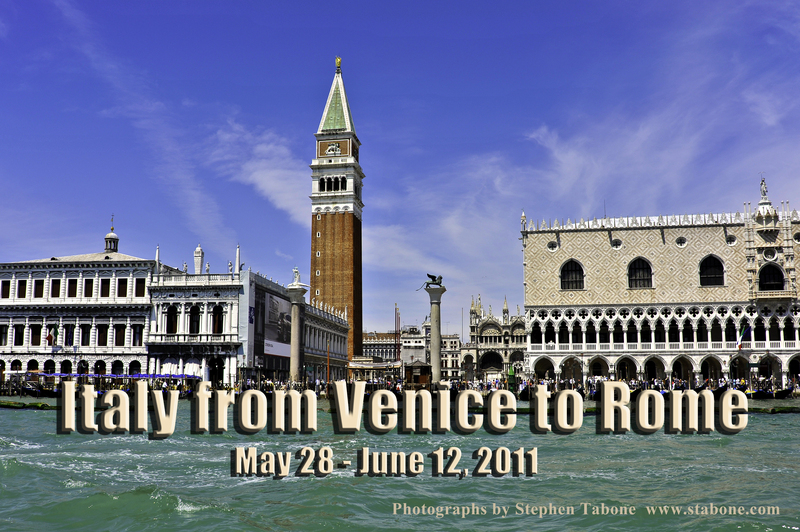 I just enjoyed watching the slideshow of Italy and can not decide what were my favorite images. Was it the waterways of Venice, the charming houses of Burano, the tile roofs of Sienna, the marble of Florence, the stone remnants of Pompeii, the lush countryside of Cortona, the blues (water and skies) of Positano and Capri, or the famous and not so famous architecture of Rome? It was all of these and more … the simple windows with their colorful flower boxes, the magnificent doors (and trying to imagine what is behind them), the mysterious alleyways leading to … , and the cupolas (domes)! Magnifico!